They can do a lot - but perhaps not as much as you expect! 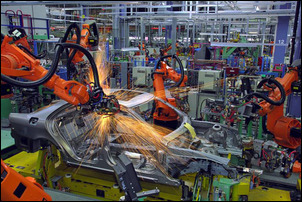 Every car manufactured from steel uses numerous spot welds to hold together its body parts. In fact, a typical bare body shell contains about 5000 spot welds, and some car factories produce more than 20 million spot welds per week. Spot welding is strong, cheap and fast. So can those advantages also apply to home workshop use? Well, the news isn’t all good. But first, how does spot welding even work? Spot welding, also known as resistance spot welding, is one of the oldest of electrical welding processes. Elihu Thompson, an English-born American engineer, invented spot welding, with his major patent in this area awarded in 1885. "All that was required was a transformer with a primary to be connected to [high voltage power] and a secondary of a few turns of massive copper cable. The ends of this cable were fitted with strong clamps which grasped the pieces of metal to be welded and forced them tightly together. The heavy current flowing through the joint created such a high heat that the metal was melted and run together." This diagram shows what Thompson was describing. When such high current is passed through the sandwich of clamped sheet metals, the higher resistance that is present at the join between the two metals causes heat to be generated. That heat is sufficient to create a ‘nugget’ of molten material that, when it cools, has joined the two sheets. No metal is added and the weld is actually within the join of the two sheets, rather than external to them. 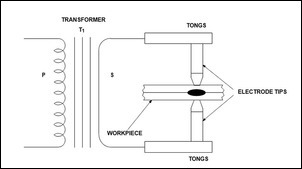 This diagram compares a spot weld (left) with a weld made by drilling a hole in one sheet and then using a MIG or TIG to weld through the hole to join the sheets (ie a plug weld). Note how the spot weld is fully internal. The greater the amount of current flowing through the resistance formed by the two sheets being welded, the greater the heating that occurs. In fact, if the current is doubled, the heating value is multiplied by four times, so small changes in current make more of a difference than you’d first expect. - Squeeze time – the length of time the sheets are clamped together by the electrodes prior to current flowing. 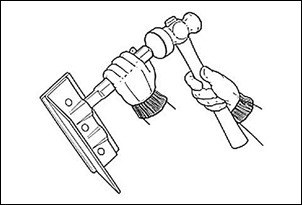 -Hold time – the length of time the electrodes stay in contact with the weld after it has been formed. The pressure with which the metals sheets are held together will affect the resistance that is present at the join. If the sheets are clamped too tightly, the resistance will be lower (and so therefore will also be the heating). But if the force is too low, the electrodes may stick to the work and expulsion of molten material may also occur. The dent formed by the electrodes should never be more than 25 per cent of the thickness of the combined sheets. Control of weld time is important, and in some machines it is in fact the only aspect able to be altered by the operator. Too long a weld time and the base metal may get so hot it boils and metal is expelled from the joint; too short a time and the nugget may not form correctly. The hold time, where the electrodes are in contact with the weld but current is no longer flowing, is important in determining the rate of cooling of the weld. The pressure applied during the hold time also acts to forge the weld when it is still plastic. Unlike a MIG or TIG weld, where external inspection with a trained eye can tell you a lot about the quality of a weld, with spot welding an external inspection tells you relatively little. Therefore, by far the best way of assessing the quality of a spot weld is by destructive testing a sample. The two tests are the ‘peel’ and ‘chisel’ tests. 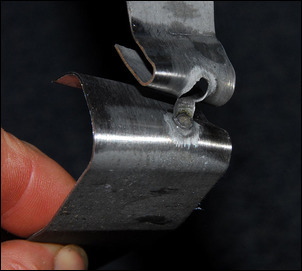 Shown at right is an example of a peel test of a high quality spot weld, made with 1mm + 1mm sheet. Note the size of the nugget and the fact that the base material has failed before the weld. The chisel test forces a chisel into the gap between adjoining spot welds until either the base metal or the weld fails. During the test, the chisel should not touch the weld nugget. 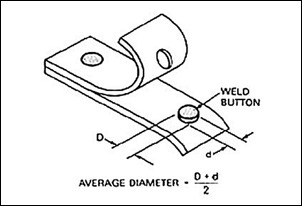 Again, performance of the weld is assessed by looking at the weld nugget diameter and seeing whether a hole is torn in one of the sheets. The biggest limitation in the use of spot welders in home workshop is the amount of current that can be drawn from the mains supply – and so the amount of current available in the secondary circuit to do the welding. All large industrial welders are 415V, three phase, and so can be very powerful. But single phase, general power points are generally limited to a nominal 15 amps – and even that usually requires a special circuit from the meter board. 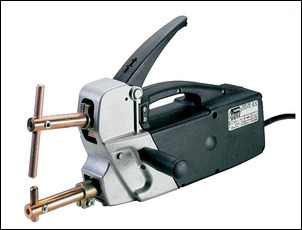 So what single phase, small handheld spot welders are available? And what can they weld? The Telwin Modular 20/TI is typical of the ‘hobbyist’ breed. It requires a 15-amp plug, and the maximum short circuit output current is 3800 amps with a secondary voltage of 2V. The unit has a timer adjustable from 0.1 to 1.2 seconds and the clamping force can be varied from 40 to 120kg. It weighs 10.5kg and costs around AUD$1,100. Importantly, the manufacturer suggests that the maximum thickness of steel sheet it can weld is 1mm + 1mm. Stainless steel has a higher resistance than mild steel, and so for the same current flow, a larger amount of heat is generated. This means that a spot welder that is, for example, able to weld a maximum thickness in mild steel of 2mm + 2mm can probably weld stainless steel that is 3mm + 3mm. The Telwin described above is a ‘proper’ welder from a reputable manufacturer. So what about the much cheaper units that are available? 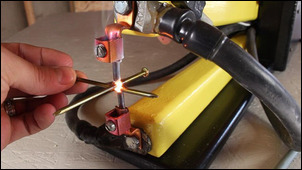 Many cheap hand-held spot welders on the market have electrodes that are tapered down to slim points, in turn making the nugget smaller in diameter. Some cheap units also have less power than the Telwin - and yet claim to be able to weld thicker materials (eg 1.5mm + 1.5mm). Obviously, some things here do not add up! In short, to get a new spot welder that will give good spot welds on (say) 2mm + 2mm steel sheet, a three-phase unit with an adsorbed power of something like 16kW is normally needed. That puts it out of the range of the home workshop – both in cost and power supply requirements. Putting some of the figures in context that have been mentioned in this story, Toyota states that to repair some of their current cars, a spot welding pressure of 300 kg force is needed together with a current flow of 10,000 amps for 0.3 seconds. Honda says 350kg and 9,000 amps. So putting together a car body shell with the same quality spot welds as the factory achieved is not really an option in the home workshop. But that still leaves an enormous range of sheet metal projects that a smaller spot welder can weld. 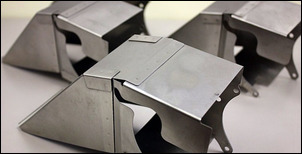 Any project using raw or galvanised thin sheet metal, where you may have previously used pop rivets or screws and nuts, can be rapidly spot welded. But it’s probably worth saving up for a decent brand name welder rather than going for a cheapy. Or… what about buying an older second-hand machine? We’ll do just that in the second part in this series. So if a spot welder consists only of a transformer, a switch, some arms and electrodes, why not build your own? And, if you look around the web, you’ll find plenty of people who have done so. One approach is to use a microwave oven transformer with one winding removed and replaced with just a few turns of thick cable. Use heavy copper cable for transmitting this power to the electrodes, and away you go. The basic problem of these home brew designs is that there is insufficient secondary current. Instead of thousands of amps, there are hundreds. This lower current allows the welding of only very thin materials, or of thicker materials of very low mass. For example, you can sometimes see pics of these home-built machines welding together some nails, or some thick steel washers. But if you substitute sheet steel of the same thickness as the nails or washers, the welder won’t have enough power. That’s because the thermal mass of the welded materials is so much higher than the small items – and so the material rapidly conducts the heat away from the weld. If you have specific project need (eg welding together very thin stainless steel sheet, or welding tabs to rechargeable batteries) then a homebuilt design might be sufficient, but if you want a general purpose spot welder, building your own from scratch is not the answer.